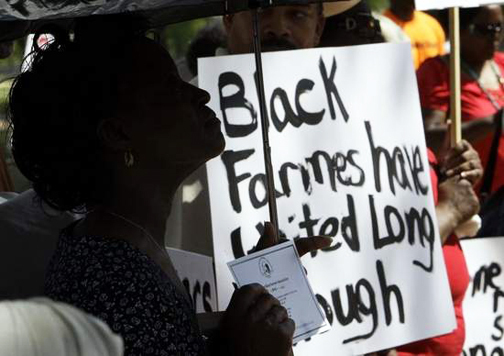 WASHINGTON - U.S. Federal District Judge Paul Friedman in Washington is reviewing the $1.25 billion settlement in a class action stemming from allegations the government discriminated against black farmers in loan processing. Friedman met for about eight hours with the plaintiffs' team, government lawyers and farmers, some of whom traveled from across the country to attend the fairness hearing. Friedman said he will promptly issue an opinion on whether the settlement is fair and reasonable for the tens of thousands of potential class members. The Blog of Legal Times reports the settlement would compensate farmers who, despite their eligibility, did not participate in an earlier deal executed with the U.S. Department of Agriculture. Marks said a group of farmers who spoke at the fairness hearing sought various revisions to the settlement, which was reached in February 2010. Friedman in May granted preliminary approval for the deal. Several speakers, Marks said, disagreed with the plaintiffs’request for more than $90.8 million in legal fees, the top of the range set out in the settlement. Friedman is reviewing whether the range—4.1% to 7.4%—is fair. He will decide later on how much money the lawyers in the case should be compensated. The U.S. Justice Department said it opposes the $90.8 million fee request and will file court papers in the coming weeks outlining the government’s position. If Friedman approves the deal, the settlement requires all claims to be submitted within 180 days. Marks said it will be “an enormous task” to get all claims filed. A third-party neutral will review the claims on a rolling basis. Marks said the plaintiffs’ lawyers, who also includes Henry Sanders of Selma, Ala.’s Chestnut, Sanders, Sanders, Pettaway & Campbell and Gregorio Francis of Morgan & Morgan, are hopeful all eligible farmers will receive payments by the end of next year.